The National Capital Area Chapter's December meeting will be the annual holiday party on Saturday December 8, 2018. The location and details have been sent to members by email. The December Petal Tones has also been sent to members. 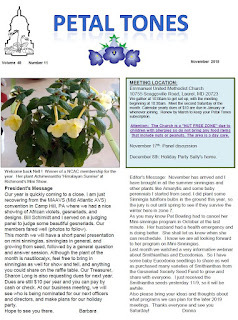 The National Capital Area Chapter of The Gesneriad Society will hold its next meeting on Saturday November 17, 2018. Topic: panel discussion on Sinningia and growing from seed. Plant of the month: Nautilocalyx. 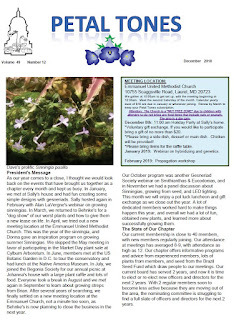 The November issue of Petal Tones has been emailed to members. The National Capital Area Chapter of The Gesneriad Society will hold its next meeting on Saturday October 13, 2018. The October issue of Petal Tones has been emailed to members. Doors open at 10. Meeting begins at 10:30. The September issue of Petal Tones has been emailed to members. The National Capital Area Chapter of The Gesneriad Society will be meeting this Saturday, July 14, 2018, in Fairfax, Virginia. Details were sent to members by email. 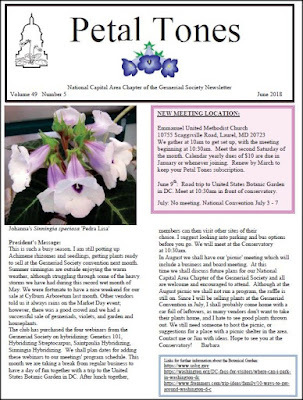 If you're a member of the National Capital Area Chapter, you should have received the July issue of Petal Tones by email. held on Saturday, March 10, 2018 at The Behnke Nurseries. Set up at 10am, meeting starts at 10:30 am. The topic is Dog Show and Culture (bring plants in to show how terrible they are and we shall learn how to fix them). The meeting on February 10 will be held at a member's home. Details have been sent to members via email. January's meeting will be held on the 13th, at a member's home. Details were distributed to members by email.